Discussion in 'Feedback Requests' started by Rize of the Summonds, Nov 5, 2016. 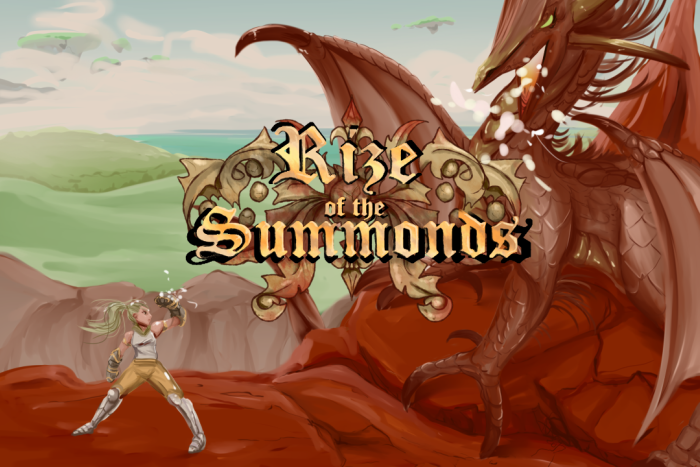 "Rize of the Summonds" is a unique 2D medieval style metroidvania game, in which player has the power to transform into legendary Summonds along their journey in the Kingdom of Elaria. Use the transformations of the fearless Dragon, stealthy Wraith, heavy Orc, agile Cat and many more; each equipped with unique abilities in order to traverse new areas, defeat enemies, complete challenges, overcome traps and solve mysterious puzzles. The heavy Orc's weight to step on pressure plates, agile Cat's speed to jump high and run fast are just a few of the unlocked abilities. Discord link above: You will be provided with update news, share ideas, share your own work, participate in future giveaways, provide feedback, possibly receive discounts of our game when released, instantly chat with the devs, and much more. Please provide comments and let us know what you guys think of our concept. Tell us what you guys like and dislike about our game so far and what we can do to improve it. Also, what bugs have you discovered while playing our game? Do you see yourself purchasing a copy of this game, when released, at a low price? Rize of the Summonds is a metroidvania, fantasy, sidescroller game in which you can transform into an orc, wraith, cat and many more summonds, to unlock unique abilites for combat, puzzles and to reach new areas. Unlock these new summonds, uncover the intricate story of the game, complete the challenges and missions and manage your strategic combat abilities as this game will not always hold your hands. So be alert at all cost. Oh and one more thing, there will be many upgraded items/weapons and spells. Wraith summond - So each summond will grant the player a special ability, along with their regular attack abilities, allowing the player to reach new areas that they couldn't reach before. The cool thing about the Wraith is, he is floating in the air and his special ability consist of dropping to ground level, in order to hover inside small holes. Orc summond - You can transform into an Orc who is bigger, stronger but slower than the other summonds. Its cool to be able to transform into a big, ugly Orc and then into a small, cute Cat creature. The Orc summond uses a ton of stamina when running, attacking, and jumping. Don't even bother to jump using this summond because he will not be able to reach platforms. So jumping will just consequence in you losing stamina for no reason. This game will have so many secrets like this. Its awesome!! You will have to manage your stamina because we want this game to be challenging but not brutally impossible. This independent team is filled with talented, modest and committed developers. Our next milestone goal is to create a Kickstarter campaign, once we see many fans who loves the concept and would support this game and the company. No worries, we will make sure this game is fully developed and we would always updated you all with our progress. The more fans and support, the faster the development will be because we definitely want to quit our jobs, giving us more time to work on this game, every day and week. Comments are always welcome. Spread the word!! Help bring Rize of the Summonds to your hands. Orc Summond: He likes to go berserk, yet you still have to manage your stamina. Another hint on stamina is, your stamina drains by running, attacking, jumping, blocking your opponent's attack etc.... When your stamina reaches 0, I promise you it won't be brutal. That's all I can say for now. Dragon Humanoid Summond: As you can see the first official level you will enter is the Dragon's Lair, in which you will obtain this Dragon humanoid summond, somehow. Beware of the enemy dragons, because this is their lair, despite of the other enemy types that's inside as well. Akira protagonist character: Character you start off with. She will be able to transform into the other summonds once you obtain them. You obtain these summonds by..........yeah I will keep that a secret until you actually play the game. Wolf enemy: Will have different forms of this wolf. Will be excited to share, once the tie comes. Female Caster: She is more than likely going to be the first mage enemy character introduced in the game. She will be throwing fireballs from the container she's holding. Dragon humanoid enemy lvl 2: This enemy is an upgrade to the other Dragon humanoid enemy. This one has wings and different skin color and will have increased attack damage. Open to any feedback. I can't wait until we start adding particle effects into the game. Our vfx artist has started working on the transformation particle effects, and will later work on the fireball and firebreath particle effects. We will keep you all posted and continue to provide teasers. Stay tuned! Here is our Menu Music Sample. Please continue to provide feedback and share our game project!! Here are some of our particle effects on display. It's going to look better when actually programmed as spells for the characters. In the video, I activated the loop function for the effects, and doesn't show the full effect when repeated. Still looks nice! Character art for King Nasir. No spoilers, so I can't say much about the character. We are working on keeping our character art cohesive to maintain the art style, so the game can look more appealing. More particle effects and visual/sound feedback and more characters are being implemented into the game. Can't wait to show you guys updates!! Check out my team's upcoming 2D metroidvania game, on Steam Greenlight Concept page. Please provide feedback, follow, and share with friends. We definitely appreciate it. We are getting some good feedbacks through our Steam Greenlight concept campaign. We won't actually launch Steam Greenlight campaign until we gain a good amount of fans through facebook, twitter, and forums, and until we implement more polished work into the game. The time will come, sooner than we think!! Everyone, make sure to follow our page and forum so you can stay updated with our project and plans. We would really appreciate it. Stay tuned!! Hi, your game looks promising and it's clear you've done a lot of work on it. Something I would say is that visually it feels a little disjointed. The characters are all side-on but the environment is almost isometric. I realise that's probably not the most useful feedback to get this far into the project but there might be a few things you can tweak to lessen the jarring effect. Also the transformation into the Orc is a bit too much of a "pop" I'm not sure if it's just the fact that it's still a work in progress but some kind of effect would make that transition more believable. A big part of making effective game mechanics is making them feel reasonable to the player. If you had a nice part of the UI dedicated to showing what character you currently have selected, and a cool morph animation / particle effect when you switch between them I think the transition would feel a lot better. We are revamping our character art style to make it more cohesive with the environment art. Displaying Akira (the protagonist character) standing on top of a rock platform, that's going to be used for the Skyzone level. Smashed Pumpkin, thank you for the critical feedback as we will use this useful information to continue to revamp our game. We definitely have to check out that World of Warcraft character selection mechanic, because this could be suitable for our game. Not really knowledgeable with WoW games, therefore we were inspired by the selection wheel from iconic games such as GTA V, but this WoW mechanic seems simpler. Either way, we will implement an element that allows the player to switch between the different summonds quickly, and has outstanding visual feedback. Created a before and after collage for some of our characters. The after images are more vibrant and saturated, well-suited for our new art style. Stay tuned for more updates, including teases to some of our revamped animations for these characters and more. Our next milestone is to polish as much of the game as possible, to showcase it at an upcoming Independent Game Convention, located in Chicago. We will keep you all updated!! Official background music for the Dragon Lair zone. Our music composer is planning on extending this sample to make it a total of 2.5 - 4mins so it can really loop seamlessly. Inside of the Dragon Lair Zone (the first level in our game). Artists are creating more environment pieces that we can use to fully create the level space in Unity Engine. We plan on using a special plugin/tool in Unity that will allow us to bend some of these platforms in order to create ramps. Feeling excited and can't wait to post more news!! Very Nice gaming Concept.Nice game art. Rize of the Summonds likes this. Thank you for the positive feedback. We will continue to produce more great content for the game. (Enemy - Skeleton Lvl 3 Polished) We designed a skeleton character who seems small and vulnerable, but actually have the strength to carry a big shield (on the left hand) and a massive sword (on the right hand). Thinking logically will penalize your creativity at times. Therefore, we followed this formula for all of our characters:thinking outside the box and coming up with new/cool ideas). Please support our upcoming game!! Will provide more gameplay videos and a trailer. Stay tuned!